It appears I’ve gone kale sprout crazy! I’ve always loved Brussels sprouts–even as a kid. Then, the kale craze happened and I was happy to get right in sync with the whole movement because I have yet to meet a vegetable I don’t like. And dark, green leafy stuff like kale sprouts? Oh yeah! 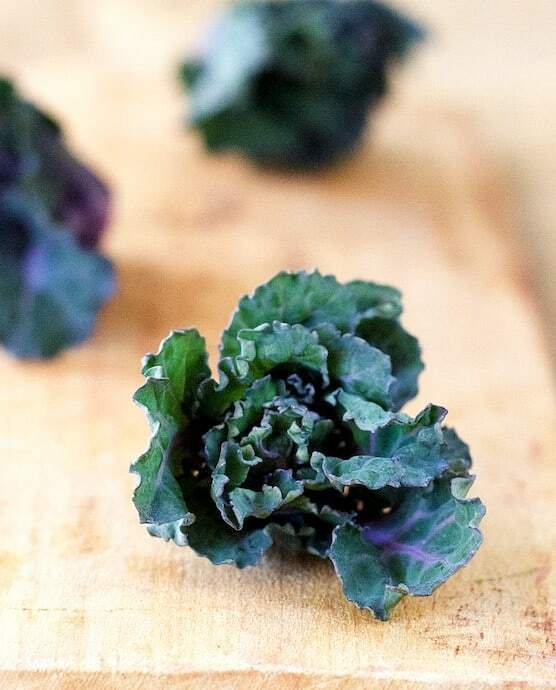 Kale sprouts (aka “Kalettes” by their brand name) are a cross between red Russian kale and Brussels sprouts. Until recently, I had only been able to get them at Whole Foods. I twisted the arm of the store and produce managers at the Kroger that I shop at and they agreed to keep these in stock for me. Don’t have to drive as far so thanks, guys! Last week an amazing thing happened. I purchased a couple of bags to roast as a freebie for the client I was cooking for that day. I simply tossed them with olive oil, salt and black pepper and roasted them to where the outer leaves were super crispy, then set them on top of the stove to cool. Their 10-year-old daughter Isabelle asked to sample them and then kept coming back for more. Love when kids love veggies! 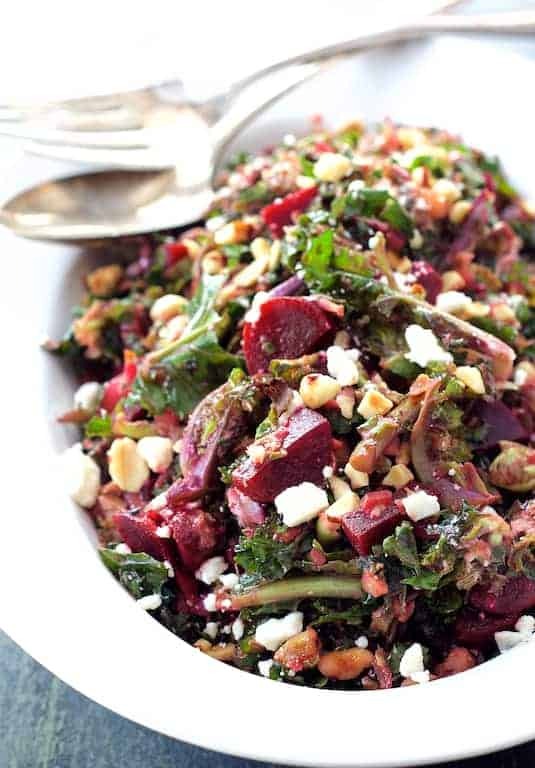 Now about this Shredded Kale Sprout and Baby Beet Salad with Walnuts and Goat Cheese! Shredded kale sprouts, red onion, pickled baby beets, walnuts and goat cheese with a balsamic vinaigrette. Flavors that all rock together! You could go to the trouble of roasting the beets, but I like the extra acidity of the pickled baby beets and it’s so much easier. To toast the walnuts, heat the oven to 350 degrees. Spread them out on a baking sheet and when you begin to smell them after about 8-10 minutes, take them out. Burned nuts are the WORST and are totally unusable, so just watch them carefully. Use a light olive oil or grapeseed oil. An extra-virgin olive oil will taste heavy. After whisking together the balsamic vinaigrette, taste it and see if it needs the honey. A good balsamic vinegar tastes super sweet to me so you may or may not want to use it. MAKE AHEAD: Combine kale sprouts, onion, beets and walnuts in a bowl. Cover and refrigerate. Combine dressing ingredients and refrigerate. Just prior to serving, combine all ingredients per recipe, transfer to serving bowl and add cheese. 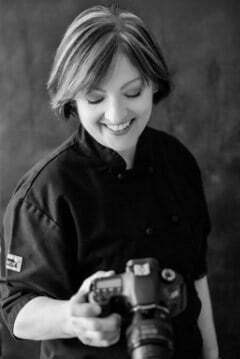 Gorgeous photography Carol and of course delicious recipe! Nice to add some micro greens or pea shoots too… it’s all amazing. Thanks, Piper! So nice to hear from you and great ideas! Love when people make it their own with their own ideas! That’s pretty much the most beautiful salad I’ve ever seen! Yum! I haven’t really gotten into beets, but have been wanting to. This might be just the recipe to do it! Thanks! It was fun meeting you at Indulge PDX this past weekend!